Raksha Bandhan signifies the strong and forever bond of love and admiration between a brother and sister. 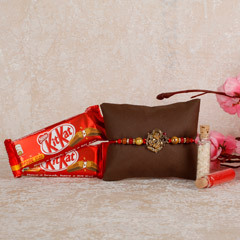 Flowerdeliveryuae.ae is here to help you all to send Rakhi to UAE to your amazing brothers. Our range of Raksha Bandhan includes beautiful and handpicked Rakhi for brothers, Rakhi sets, and rakhi gift hampers at really incredible prices! Raksha Bandhan is a festival in which all the siblings in a family come together for grand celebrations. The day is all about brothers and sisters, promises of protection, gifts, happiness, laughter, and commemorating the beautiful and fun memories of childhood. This festival is made special by captivating Rakhis that are tied on the wrists of the brothers by the sisters to take a promise of everlasting love, support, and protection from them. In 2019, this festival will be celebrated with the same zeal and excitement as before on 15th August. If your brother stays in Dubai or Abu Dhabi in UAE and is unable to make it on the occasion of Raksha Bandhan in India, then in such a case, you can send rakhi to UAE to avoid missing the celebrations of this auspicious festival with him. This surprise will make him jump with extreme happiness and will feel delighted to receive your Rakhi and other presents from you. Distance is never a problem when it is about the loved ones who are very close to your heart. Brothers share a very special bond with their sisters, and this aspect of their relationship is celebrated in the form of Raksha Bandhan all over India with great fervor and happiness. Flowerdeliveryuae.ae strives to bridge the gap between the siblings who stays far away from each other in different countries due to uncontrollable factors. When your brother resides in the beautiful city of Dubai, you can send rakhi online to Dubai from India using this online rakhi portal operating all over UAE. 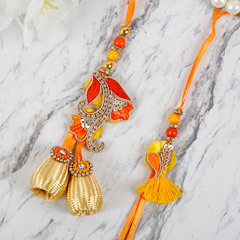 The amazing assortment of Rakhi for brothers on this website provides ample choices to the sisters to select the best rakhis online for them. 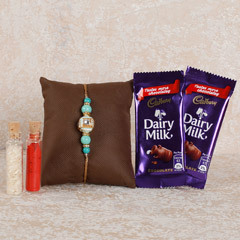 The range of rakhi on Flowerdeliveryuae.ae also includes Rakhi Gifts to UAE like chocolates, sweets, dry fruits, and cakes which come in a wonderful rakhi gift hampers along with stunning rakhis. 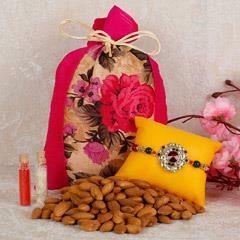 Now, you can choose from the extensive range of designer rakhis, Rakhis for Bhaiya-Bhabhi, Silver rakhis, etc. 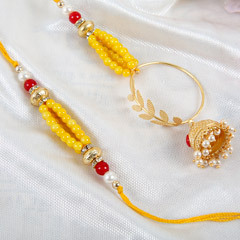 to make the festival of Raksha Bandhan as special as your brother. 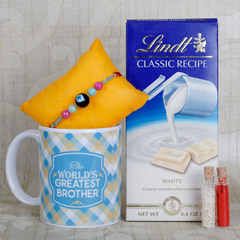 Every Rakhi listed on our website is as special as your relationship with your brothers. Though they appear just like ornaments, but holds great value and meaning in the lives of people. Designer Rakhi: This amazing collection available includes stone rakhi, divine rakhi, and bracelet rakhi designed in intricate designs and patterns to enhance the looks of your brother’s wrists. 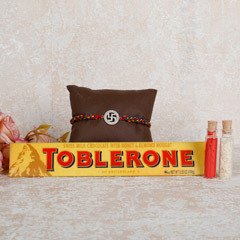 Silver Rakhi: These rakhis certainly signifies elegance and style in every way. Not very gaudy, the silver rakhi stands for auspiciousness. 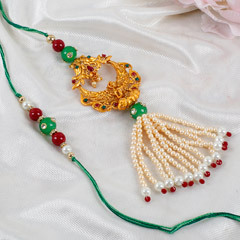 Lumba Rakhi: This kind of rakhi makes your relationship with your Bhaiya-Bhabhi much stronger. 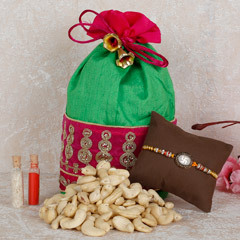 The set of Lumba rakhis is a perfect choice to send to your brother staying in UAE with his wife. 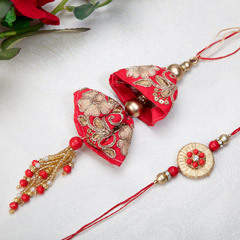 Kid’s rakhi: There is a nice collection of cartoon rakhis, superhero rakhis, and others for the lovely little brothers. Why to Choose Flowerdeliveryuae.ae for Online Rakhi Delivery in UAE? Good reach in the Emirates of Dubai, Abu Dhabi, Sharjah, Ajman, Al-Ain, Fujairah, etc. 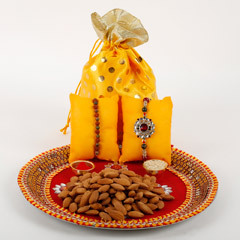 Shubh Muhurat to Tie Rakhi in UAE (Dubai & Abu Dhabi) 01:44 p.m. to 04:19 p.m.
We Like your services for rakhi delivery, very best service and delivery on time. 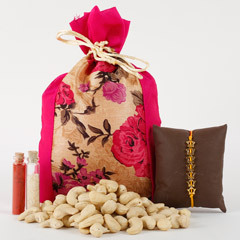 Very good service my rakhi is delivery on time. My brother was very happy on that time.